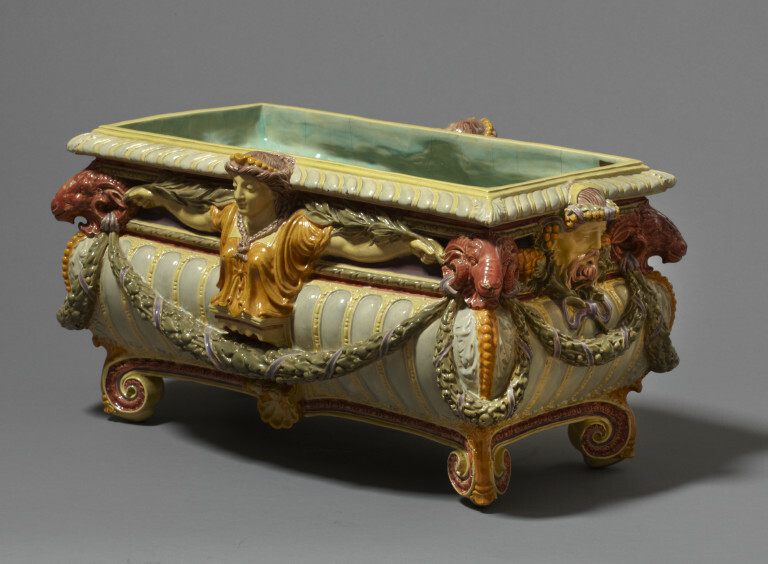 Cistern of buff-coloured earthenware, moulded in relief and covered with coloured enamels. Oblong with bowed and gadrooned sides and four small feet. On either side is a female head half-figure with outstretched arms holding two laurel-branches, and at either end is a bearded mask. At the angles are goats' heads and garlands of oak leaves and acorns. Given by Messrs. Maw. Transferred from the Museum of Practical Geology, Jermyn Street. 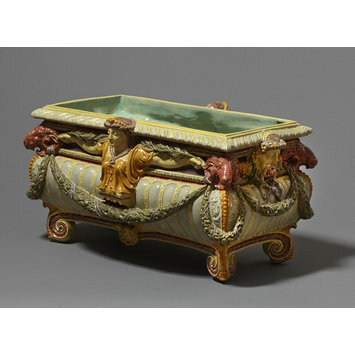 Oblong cistern of buff-coloured earthenware, moulded in relief and covered with coloured enamels, made by Maw & Co., Jackfield, 1871. Made in the Benthall Works, Jackfield.